Fast and Female was founded in 2006 by Chandra Crawford, an Olympic gold medalist in cross country skiing from Canmore, Alberta. Working with hundreds of inspiring female Olympians in a wide range of summer and winter sports, the organization hosts events across the country to counter the disheartening fact that girls are 6 times more likely to drop out of sports than boys by the time they reach 14 years old. When girls drop out of sports at this critical developmental stage, all of society loses. This is the case because inactive girls put at risk their physical and mental health, confidence, body image, academic performance and even ability to make positive choices in all areas of life. In addition to it’s work with female youth ages 8-18, Fast and Female works tirelessly to educate and empower parents, coaches and club administrators on the importance of keeping girls in sports. To learn more about upcoming Fast and Female events, click here. Visit this page to find out how your sports club, team or school can be host to a Fast and Female Power Hour presented by BUFF. The funds raised through this year’s Rocky Mountain Soap Women’s Run & Walk will help Fast and Female increase the number of impactful events it hosts across Canada. The organization will be in a stronger position to further spread the word about the power of sports for girls. 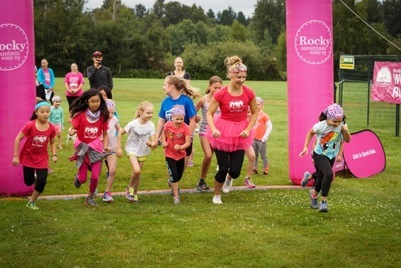 By participating in the Rocky Mountain Soap Company Women’s Run and Walk you are supporting the innovative work Fast and Female is doing to keep girls in sports throughout Canada. But you can do more! There are two ways you can help to further expand Fast and Female’s work related to keeping girls in sports.